I am a runner. It took me a long time to be able to say that. When I started running eight years ago, I would always say that I was going for a jog, even if that jog was 5 km. “Just going to jog for a few minutes on the treadmill.” “I’m heading out for a jog around the block.” It took getting a few races under my belt before I was able to reconcile my image of myself as chubby, uncoordinated kid with the less chubby, slightly more coordinated runner I had become. Why am I telling you this? Because it’s part of the reason that I’m taking part in the Nike Women’s Toronto 15k race. The Nike Women’s Toronto 15k race takes place on June 14th on Toronto Islands. This race is part of the Nike Women’s Race Series and marks the first time that the race is coming to Canada. While the race is marketed towards women, Nike is very clear to point out on their website that men are welcome to participate as well. To sign up, participants were entered into a random draw for one of 15,000 spots. I serendipitously got around this by registering as a student (hooray!). With a $120 registration fee ($100 for students), this is definitely the most expensive race that I have ever signed up for. Am I a sucker for falling for Nike’s brilliant marketing ploys? Probably. Not a lot of details have been released about the race but if it’s anything like the popular Nike Women’s Half Marathon in San Francisco, it will be a weekend-long celebration of women and athleticism. Rumour has it that instead of a finisher’s medal, runners will get a custom-designed Tiffany & Co. finisher’s necklace. I guess that’s where all of our registration fees are going. Participants in San Francisco loved the race so much, they felt compelled to review it on Yelp! Honestly, what other race has it’s own Yelp! review page? (In case you’re wondering, the event has an average rating of four stars out of five based on 342 reviews.) With all this hype, much of which is admittedly self-generated, I am expecting great things from this race. Hopefully, it won’t disappoint. Back to my reason for running this race – when I started running, I didn’t really enjoy it. I did it mostly because my best friend at the time desperately needed a running buddy for her long marathon training runs. So I would tie on my old cross-trainers and meet her at our predetermined spot. She would run at a slower pace to accommodate me and carry on a one-sided conversation while I silently reminded myself to breath. And at the end of the five or six kilometers, she would leave me gasping by the road somewhere and continue on for another 15 or 20 km. Looking bad, I was a pretty awful running buddy. Since then, I have completed a number of 10 km races, three half-marathons, two 30 km races, and as of this past fall, one full marathon. Somewhere along the way, I became a runner. I am running this race to celebrate me. With each race, I’m surprised by how far I can push myself and what I can achieve with dedication and practice. This expensive, indulgent, slightly too girly Nike Women’s Race is my treat to myself. After all the toenails I’ve lost over the years, I think I deserve a pampering run. When I cross the finish line on June 14th, I hope to set a new personal best. After all, that’s what “running like a girl” means, isn’t it? So bring on the speed training (yay!) and the hill training (boo!). Maybe there will be massages and pedicures waiting at the finish line. My feet will be a mess. Betty is a science communicator living in Toronto. Her two proudest accomplishments are completing a full marathon without barfing and obtaining her Ph.D. She has an unhealthy obsession with pancakes and good deals. Luckily, her husband is very good at eating pancakes and finding creative storage solutions. In her spare time, Betty blogs at Eat, Read, Science where she writes about the latest and coolest science papers in a way that won’t make you fall asleep. You can follow her on Twitter at @BisousZou. Next Post Put a sock on it? Thanks for sharing your story with us. Can’t wait to hear how the race goes for you. Cheers! This is awesomely inspirational. I would love to be a runner but I get so self conscious that I can only run after dark, and my greatest achievement so far was running a full kilometre, so I’ve a bit of a ways to go. 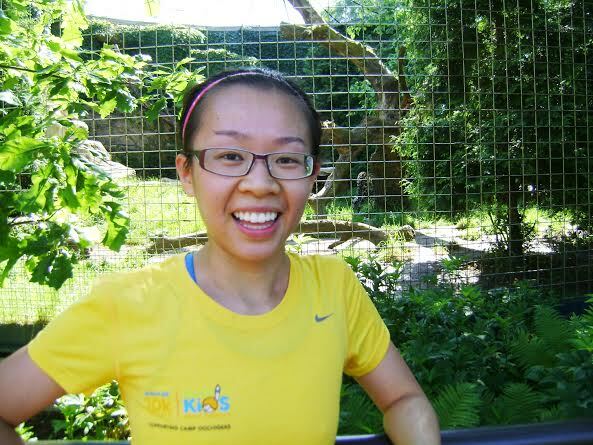 Good luck on the Nike Toronto 15k it sounds awesome! I totally understand how you feel about being self conscious. I used to be nervous of running into people I know during my runs. Now I’m waving my hands and pumping my fists when my song comes on. It’s just part of the process of getting comfortable with running. Another reason I really enjoy running is because you really achieve visible progress. Start with 1 km, then gradually add 500m at a time and before you know it, you’ll be at 5 k! Yay running! You’ve inspired me to try again 🙂 thank you. loved the post, check out ours!